There are two versions of the Playstation Vita, a WiFi only for $249, and one with 3G/WiFi for $299 (powered by AT&T). The design of the PSVITA’s layout (button configuration especially, plus one more analog stick on the right side) looks very similar to the PSP but it’s wider, has a gorgeous 5inch (940×544) OLED touch screen. The PSVITA is powered by a quad core ARM Cortex A9 processor and a quad core GPU which makes it the most powerful portable console do date. 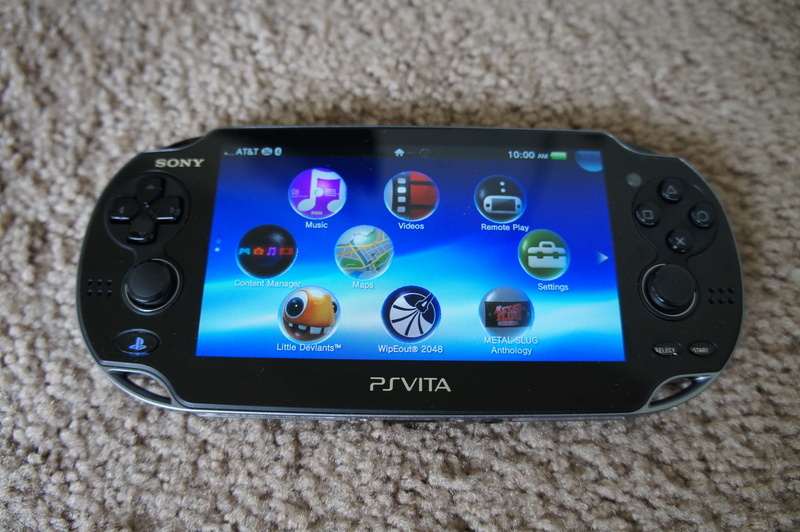 The Vita also features two 640×480 cameras which has little use for taking photos at the resolution, a REAR touch panel, Sixaxis motion sensing (much like the Move found on the PS3) Bluetooth, WiFi, and GPS (on the 3G version). Sony advertises the battery to last around 3-5 hours for gaming and that’s roughly what I was able to get out of the device. To test the performance of the PSVITA, I loaded Marvel vs Capcom 3 and which I had no problems in performing specials, combos, and super attacks. I can however see that people with larger hands may have issues hitting the analog sticks by accident because it’s pretty darn close to the D-pad and gaming buttons. I also played WipeOut 2048 and Deviants and also had no real issues with the controls so it pretty much handles as well as the PSP and PS3 controllers. The touchscreen adds a lot to the experience of navigating through the interface and games. The QWERTY on screen keyboard makes inputing text a hell of a lot better than going letter by letter with the gamepad on non touch screen capable consoles! In the controls department, all of this was very well thought out so kudos to Sony! Here’s what I find what is the most frustrating with this device. EVERYTHING is proprietary. The PSVITA uses it’s own game cartridges rather than the old PSP UMDS (understandable and forgivable) that load on top of the unit. You can however download your own games from the Playstation Network and load them on memory cards specifically for the Vita which looks like the Sony M2 and MicroSD cards that ARE NOT COMPATIBLE with this device! In fact, the Vita also doesn’t take the Memory Stick DUO cards that Sony forced us to buy for the PSP and digital cameras! The Vita memory cards range from $20 for a 4GB card all the way to $100 for 32MB! You also have to keep in mind that a lot of games REQUIRE a memory card to even play which is not included on the non-bundled packages. Just remember to have a decent sized memory card when downloading multiple games because they can easily take up 4GB! 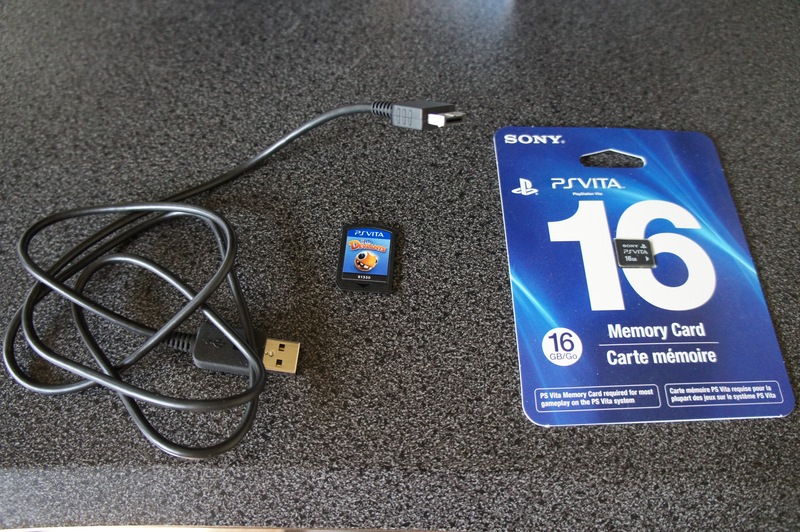 Also keep in mind that the PSVITA uses the memory card to hold your games’ saved data. To make matters worse, the PSVITA’s sync and charge cable is a NON-STANDARD USB cable that costs $20 unlike the PSP which you can use any mini-USB cord! Of course, this is just being Sony being Sony. There is no portable gaming device that even comes close to what the PSVITA’s screen has to offer. The beautiful 5inch OLED touchscreen makes good use of the real estate of the front of the Vita. Graphics look absolutely stunning on the Vita at all angles. In a dim or well lit room, viewing the screen is flawless under any lighting conditions. However, outdoors in direct sunlight is where the screen becomes almost unusable. Other than that, the large 5 inch screen is worlds apart from the iPhone’s 3.5 inch screen. The Vita comes complete with Bluetooth and WiFi connectivity, and if you get the 3G version for $50 more, you’ll be able to get online through the AT&T network. Setting up Bluetooth and WiFi is pretty straight forward as it easily found my Apple Airport Extreme router at home and LinkSys router at work. 3G is somewhat useless at this time. Sure you can get online to surf the web, see who’s nearby using NEAR, and use the location features but that’s about it. You get metered bandwidth with AT&T’s data plans that range from 300MB to 5GB using 3G. Sorry folks, the PSVITA is NOT LTE capable so you can forget about playing with friends without the use of WiFi. 640×480 camera on both front and rear. Not sure why they are using 1995 technology on a 2012 device. You definitely won’t be using this to take serious photos. With the 1.61 update, you can also record video as well, but then again… would you really want to? 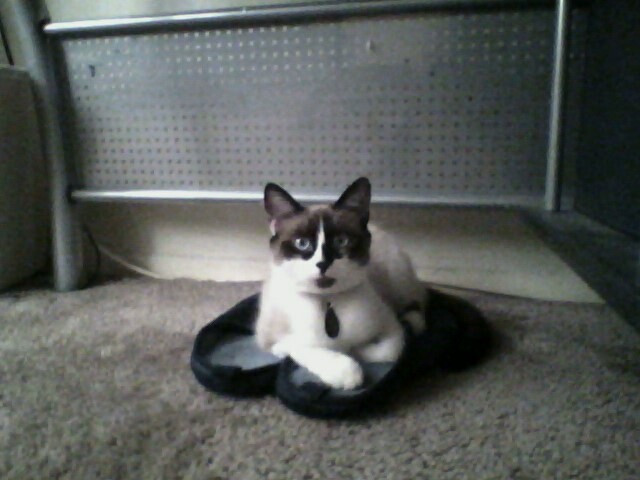 Sony should have at least included a megapixel camera so it can take some semi decent photos. It’s not that important but good to know that it’s there. Sony made a very smart move eliminating the old XMB interface and replacing it with something completely different and touch screen centric on the PSVITA. Any use of the gamepad controllers has been made unnecessary. 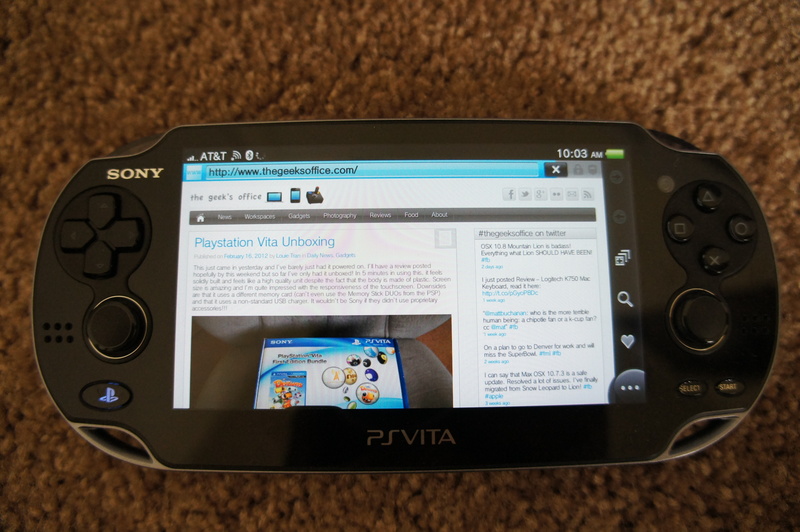 Navigating through the Vita is easy, intuitive, and is unmatched by other portable gaming devices. The PSVITA’s OS borrows a lot of aspects of WebOS especially for multitasking when switching in between applications by flicking through “cards” very much like the PalmPre smartphone. Basically, if you want to launch an application, you tap the icon. If you want to scroll up and down, you do so using the touchscreen. If you want to go to the next screen, simply swipe in that direction. If you want to go back to the home screen anywhere whether it be on the OS or in a game, just press the Playstation button on the device. It’s really that simple. You don’t have to go to menu through menu to find something like the XMB Interface that’s on the PS3 and PSP. If you get stuck, there are help menus and the “Welcome Park” tutorial is useful in learning the features of the Vita. The OS itself is also easily customizable where you can change your background colors, move apps around, create/delete pages to organize your icons. Even the Playstation Store benefits from using the touch screen navigation. Inputting your login info, searching for games, purchasing, and downloading has never been this easy. You can even pull up a list of what’s currently downloading or what’s been downloaded by tapping the bubble on the right hand corner of the screen. While we are on the subject of the Playstation Store… unfortunately you can’t purchase or download any PSOne and PS2 games YET. However, it has been mentioned that this will be available SOON after launch. I would definitely love to play Final Fantasy VII and Symphony of the Night while taking the Vita with me. What good is a mobile device without its apps? The PSVITA comes with a handful of core apps and there are also apps that are available for download at the Playstation Store. The Web Browser is nothing really to write home about as it doesn’t support Flash or HTML5. The performance was actually quite disappointing even when it’s running on all that hardware the PSVITA has. Even the simplest of pages loaded slowly and you will get a lot of gray and white square boxes when you scroll up and down a page. It does feature pinch to zoom and having a touch screen keyboard helps but you’ll probably want to stick to the browser on your smartphone rather than use the one on the Vita. With the new firmware update, the Vita includes Google Maps functions much like that found on the iPhone. And if you have the 3G version, the GPS is functional but the app doesn’t do turn by turn directions. Another nice feature to have, but you’re better off using your smart phone or a real GPS device. The PSVITA also includes multimedia playback. The Music Player supports MP3, MP4, and WAV files which can run in the background while you’re using apps or playing games. The Video Player supports H.264 at the max of 720p resolution. There is no support for Divx or Xvid like the PS3 is capable of but video does look great on the large 4inch OLED screen. I watched an episode of Nikita in 720 on the Vita and was satisfied with the playback quality. You can also download more movies, games, and TV shows from the Playstation Store but only SD content is currently accessible. What is this NEAR that’s on the Vita? It’s Sony’s own Social Networking app that helps you locate other Vita owners (friends and strangers) nearby so you can see what they’re playing. Although the concept itself is actually pretty cool, how it’s executed and what it is currently capable of is an entirely different story. Yes you can find people near you and see what they’re playing and that’s about it. You can’t really interact with them and all you can do is comment on the games that they play not with words but with a handful of emoticons that are all positive. LAME. How hard is it to implement more interactivity on this supposedly “social” app? Would be nice to be able to send messages, or invite to a multiplayer game, or event WRITE comments on games. Maybe even include a VITA only forum for people to post on within the app. I guess we have to give this app some more time. In the near future, there will be more downloadable apps such as Twitter, FaceBook, and Skype which are not available yet at the time of this writing. At this point if you want to update your FaceBook, surf the web, and send messages to your friends, stick to your smartphone. If you’ve come this far in reading the review and get a sense of negativity from what I’ve been saying, you’re absolutely right. As a mobile and social media device, the PSVITA still has a long way to go. However all of those features are SECONDARY. The whole point of owning a PSVITA is to PLAY GAMES and this is where the device truly shines. Your games can be downloaded onto the proprietary memory cards or you can purchase the cartridges retail. All games for the Vita are available in both formats. You actually save around $5 if you download the game onto a memory card and you don’t have to pay tax! As mentioned earlier, the Vita is compatible with the PSP games that are available in the Playstation Store which are upscaled and enhanced with bilinear filtering to smooth out the edges so games will look better for the most part. You have an option to turn this feature off if you are not happy with the effect. Games on the Playstation Vita are the best I’ve seen on a handheld and are very close to what the PS3 can produce. Nintendo and Apple fanboys can say all they want but believe me, once you load up a fast paced fighting game like Marvel Vs Capcom 3, a racer like WipeOut 2048 and Uncharted which really pushes the hardware, there is nothing that comes close to what the Vita can produce. The experience is further enhanced with the controls being well laid out and the touch screen compliments the games too. 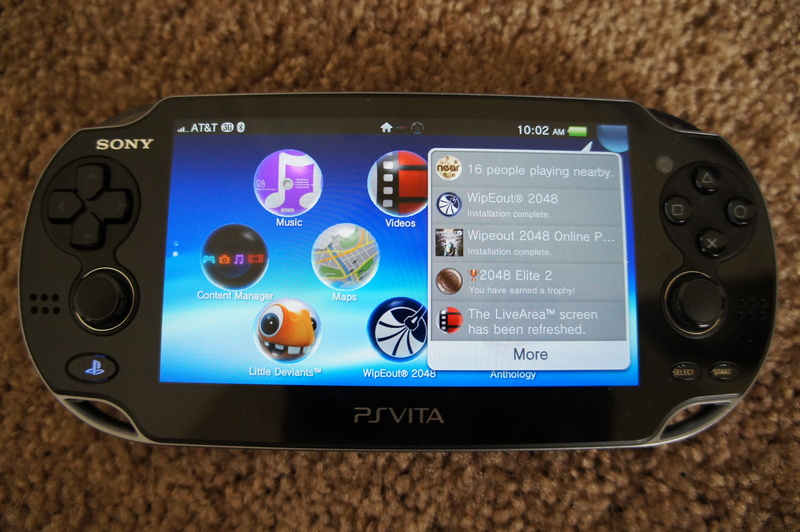 Games like Deviants make good use of all the Vita’s control capabilities such as the gamepad, touch screen, rear touch panel, and even the camera for some augmented reality fun. The possibilities are endless on what you can do with the Vita in terms of gameplay. As a portable gaming device, the PSVITA is the best that’s out there right now. Games are stunning thanks to the powerful CPU, GPU, and gorgeous display. The touchscreen, controller, and interface are very well thought out so it can definitely accommodate any type of game you throw at it. It’s not awkward and frustrating when playing fighting and action games like on the iPhone or iPod touch, and you won’t get a headache when playing for long periods of time like on the Nintendo 3DS. The Playstation Vita however can get expensive to own because of proprietary media but that’s something that you’re going to have to live with when owning a Sony product. Also the battery life could be better since it’s not user replaceable. Also a lot of apps such as NEAR and the online gaming functions have a long way to go but that can be improved over time. Keep in mind that the PSVITA is meant for games first. If you want to use it as a web browser or take pictures and post on FaceBook, stick to your smartphone. saw it on gamestop yesterday, and i must say, the screen looks gorgeous, but never noticed the size its the same as the normal PSP. How you feel the console? good? bad?, i ve already made a mistake buying a gaming console too early (3DS) and sold it months after because i couldnt find any good games. do you think this console its worth $250? The build quality is solid even though it's made of plastic but it definitely feels high quality. It's worth it if you like the games that are on the device. It's all about the software. So far, Uncharted, WipeOut and Marvel Vs Capcom 3 are awesome. The device itself does get expensive because you NEED to buy a memory card on top of buying the games because there's no onboard storage on the device itself. I bought the PSVITA 2 weeks ago and I must say it is the coolest among others out there. I like the games and screen although the battery life is a bit disappointing. First of all, thanks for the review about PSVITA because I am planning to buy this on my brother's birthday. 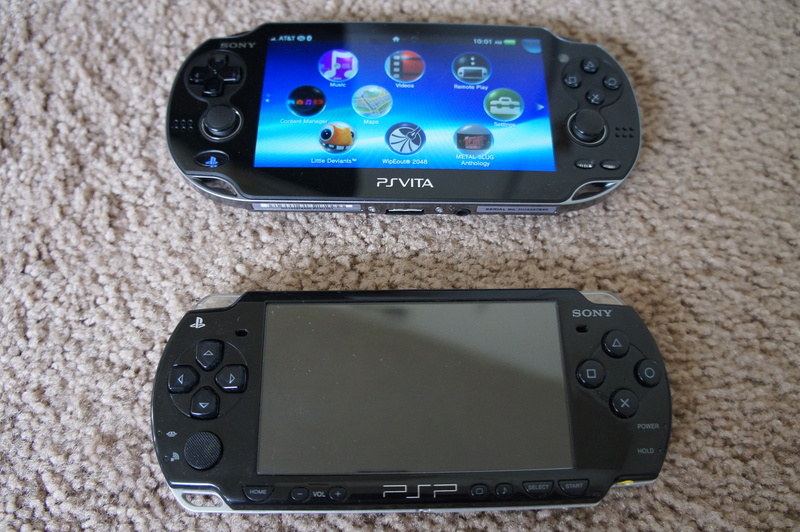 Various latest versions of PSP are launched and these are quite popular among children’s they enjoy to play games on it. The best essay services reviews Sony Company enhance user experience and doing better design and look of their play stations to make them attractive. Those reviews will be valuable for number of peoples and want their latest version. In this modern age latest devices are available. According to consumer cellular customer service people are using iphones and ipads also these days. They are playing new games in smart phones. They are downloading new games to be entertained and play games online also.